I will not comply with Obamacare. 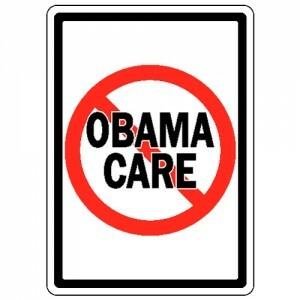 I am unequivocally not going to be complying with Obamacare. I also won’t be purchasing health insurance at 4 times the regular price, nor will I participate in the government-funded “exchange” for “affordable” healthcare. Now, first, let me be clear – this isn’t because I’d be paying $20,000 per year for the crappiest coverage. In reality, Obamacare and the subsidies my family is eligible for would make the cost incredibly reasonable – but that is not the point. The point is this: I am an American, and as such, I refuse to be forced to purchase anything else. I have already been forced to have car insurance, forced to purchase annually the “privilege” of driving via a license and having a (paid-for) car on the road via a license plate, and forced to pay taxes on my income and every purchase that I make. When I moved back home to America after living in Canada, I never expected to be subjected to government coercion on this grand scale. I will not comply. The government is fond of saying that they will not negotiate with terrorists. Well, neither will I – and the US government under the reign of Barack Obama is the biggest terrorist organization around. Michael Rivero of What Really Happened gives the best explanation I’ve seen for why the government is so intent that everyone must participate in this program. They have run the country into the ground and want to force us all to pay as they vainly struggle to keep things afloat. This is a last ditch effort – the only alternative is economic collapse. There are numerous reasons for my planned non-compliance. 1.) People who make more money than I do should not be forced to subsidize my health care. I have no desire for a handout and this is assuredly a handout. One of my closest friends will be paying over $15,000 per year for a family of 5. With the small amount that I’d pay for my family, it is quite clear that my friend, and others like him, would be paying for us. I have always paid my own bills and don’t expect others to take up my slack. I am not a welfare case. 2.) Despite the fact that my family is apparently far before the poverty level, we don’t feel poor. We have everything we need and some of what we want. I budget carefully in order to be able to pay for things like the emergency trip to the dentist for my daughter last week. My child wears nice clothes to school, always has enough to eat and seems to feel that she has the same privileges and possessions as her friends do. 3.) This is going to delete the middle class. Once the wheels are truly in motion, there will no longer be a middle class. Everyone will be dirt poor or well-to-do. There won’t be any middle ground, as average folks watch their expenses skyrocket. Soon people will be forced to make the choice between Obamacare and food. 4.) This is just another way to make the populace dependent on the benevolence of government. Much like the push to put people on food stamps, what better way to make people dependent than to force them to accept this type of assistance? If private health insurance continues to spiral wildly, then almost no one will be able to afford health care without Obamacare. 5.) This is an assault on my medical privacy. Does the government need to know a person is depressed? If a woman skipped a mammogram that they feel is vital? That someone might have opted for an “alternative” treatment? If they have an STD? If they have a sexual dysfunction? NO. It directly violates the doctor-patient privilege. Furthermore, data has already been leaked and the system isn’t even live yet – all sorts of non-medical-professionals will have access to my personal information, both medical and financial. 6.) I’m not having my family’s health care decisions made by other people. What happens when I refuse to vaccinate my children? Right now, that is my choice, but when someone else is paying for it, will I still have the option to say no? I always opt for the least chemical, least invasive treatments possible, but when someone else pulls the strings will that still be an option? If I refuse treatment will they refuse payment? Will I no longer be allowed to leave my home during flu season if I don’t get the flu shot? Noncompliance with Obamacare has harsh penalties. The government wants you to feel as though you have no choice whether or not you participate. The scare tactics are already operational, as one man found when he attempted to opt out of the online sign up. If you refuse to comply, here are some of the potential punishments you could be subject to, according to a Senate research document called The PPACA Penalty Provision and the Internal Revenue Service. #1. You will be assessed a penalty by the IRS on your tax bill. You will be told to pay the fine and will not receive any retroactive health care coverage – in other words, you get nothing for your money. #2. If you, like me, refuse to pay that penalty, they’ll up the stakes by withdrawing the penalty from any tax refund that you are due. #3. If you aren’t due for a tax refund that they can seize, and you still refuse to pay the penalty, the next step might be for the IRS to pursue the penalty in the same way they would any non-payment of taxes. #4. This could include “silent” liens on your property which you wouldn’t even know about until you tried to sell something big like your home or your car. Once the tax is assessed, the taxpayer will receive a Notice and Demand for Payment, which will advise the taxpayer of the balance due—the sum of the assessed tax plus interest and applicable penalties—and request payment in full within ten days. If such payment is not made, a federal tax lien will be created under § 6321 of the IRC.18 This is often referred to as a silent lien because, at this point, there has been no notice of federal tax lien (NFTL). Without notice, the IRS’s claim against property still takes priority over most other claims; however, certain claims would be superior to the IRS claim. These include a subsequent purchaser of the property as well as holders of security interests, mechanic’s liens, or judgments, even if they arise later in time. #5. Next they could potentially empty your bank account and take your property and sell it out from under you. #6. No mention is made of taking away your driver’s license, but if you happen to be a federal contractor things could get hairy. #7. But maybe they won’t really do it. According to the PPACA, the IRS cannot go further than the silent liens for this particular penalty. Section 5000A(g)(2) of the IRC limits the means the IRS may employ to collect the penalty established in the section. First, the taxpayer is protected from either criminal prosecution or penalty for failure to pay the penalty. Second, the IRS is prohibited from either filing a NFTL or levying any property in an effort to collect the penalty. There is no prohibition, however, on establishing a statutory lien against the taxpayer’s property under § 6321. No additional limits are placed on the IRS using correspondence or phone calls, either through its own employees or through private collection agencies, in an effort to collect the amount owed. Additionally, no restriction was placed on the IRS’s ability to use the refund offset as a means of collecting the amount due. Those who are required to pay the penalty for failure to maintain minimum coverage but choose not to do so will be subject to increases in the amount owed due to interest and late payment penalties imposed on the penalty after it has been assessed by the IRS. The IRS may impose interest on tax, including penalties, under § 6601(a), (e)(2), and it may impose penalties under § 6651(a)(3). I’m not a lawyer, but it appears to me that, according to this federal document, the absolute worst case scenario is that you would be assessed penalties on your penalties and the only way they could collect those would be if you sold your home or car. The trustworthiness of both the government and the arm of enforcement for this, the IRS, are dubious, but according to the codes that I am reading, that looks like the ultimate allowable collection strong-arm tactic. Join me in saying no. So, Obama regime, bring it on. I’m not just saying no, Mr. President. But HELL, no. I am ready and waiting for the assaults from the IRS. I understand that within a period of time, I won’t be able to sell any large items that I have paid for – and that is fine – I would prefer to give them away than to pay this blood money. I have read the penalties and realize what I’m in for. I also know how other people who have said no have been treated – the IRS auditors are released like stealth weapons, destroying lives, shutting down accounts, and seizing property in order to make an example out of the resistor. However, I’m done. I will not be forced anymore. I don’t really care what the Supreme Court says – I have also read the Constitution, and no place in it does it contain the phrase, “Participation in Obamacare is your duty as an American.” Mike Adams of Natural News referred to this as “unlimited theft and confiscation.” And he’s right. I’ve started a page on Facebook called We Will Not Comply with Obamacare, where I can pass on all of the information I come across regarding noncompliance with Obamacare. Please join me there if you have a social media account. Based on the figures that Michael Rivero put forth, the refusal of a small percentage of us to participate in this extortion could throw a giant cog in the wheels of this plan. If we have learned anything about resistance over the last few years, it is that the power of social media can be an enormous factor in educating the public and letting the government and large corporations know that our voices will be heard. Sometimes revolution can be as simple as stating a calm and unwavering, “No. I will not comply. Next An Opening to Iran?